Key Words Ponte Vecchio, Gold,Jewelers, Florence, Italy, Arno River , Ponte Santa Trinità, Ponte alle Grazie. 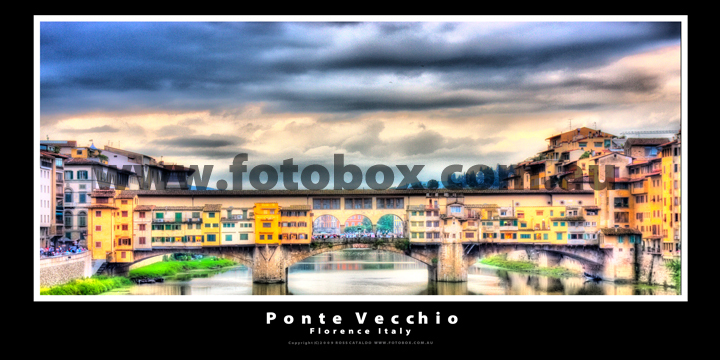 Image Information " The Ponte Vecchio ("Old Bridge") is a Medieval bridge over the Arno River, in Florence, Italy, noted for still having shops built along it, as was once common. Butchers initially occupied the shops; the present tenants are jewelers, art dealers and souvenir sellers. It has been described as Europe's oldest wholly-stone, closed-spandrel segmental arch bridge, but there are far older segmental arch bridges such as Alconétar Bridge. The Ponte Vecchio's two neighbouring bridges are the Ponte Santa Trinità and the Ponte alle Grazie. The bridge spans the Arno at its narrowest point where it is believed that a bridge was first built in Roman times, when the via Cassia crossed the river at this point. The Roman piers were of stone, the superstructure of wood. The bridge first appears in a document of 996. After being destroyed by a flood in 1117 it was reconstructed in stone but swept away again in 1333 save two of its central piers, as noted by Giovanni Villani in his Nuova Cronica. It was rebuilt in 1345, Giorgio Vasari recorded the tradition in his day, that attributed its design to Taddeo Gaddi, besides Giotto one of the few artistic names of the trecento still recalled two hundred years later. Modern historians present Neri di Fioravanti as a possible candidate. Sheltered in a little loggia at the central opening of the bridge is a weathered dedication stone, which once read Nel trentatrè dopo il mille-trecento, il ponte cadde, per diluvio dell' acque: poi dieci anni, come al Comun piacque, rifatto fu con questo adornamento. The Torre dei Mannelli was built at the southeast corner of the bridge to defend it. The bridge consists of three segmental arches: the main arch has a span of 30 meters (98 ft) the two side arches each span 27 meters (88 ft). The rise of the arches is between 3.5 and 4.4 meters (11½ to 14½ feet), and the span-to-rise ratio 5:1. It has always hosted shops and merchants who displayed their goods on tables before their premises, after authorization of the Bargello (a sort of a lord mayor, a magistrate and a police authority). The back shops (retrobotteghe) that may be seen from upriver, were added in the seventeenth century. It is said that the economic concept of bankruptcy originated here: when a merchant could not pay his debts, the table on which he sold his wares (the "banco") was physically broken ("rotto") by soldiers, and this practice was called "bancorotto" (broken table; possibly it can come from "banca rotta" which means "broken bank"). Not having a table anymore, the merchant was not able to sell anything. During World War II, the Ponte Vecchio was not destroyed by Germans during their retreat of August 4, 1944, unlike all other bridges in Florence. This was allegedly because of an express order by Hitler. Access to Ponte Vecchio was, however, obstructed by the destruction of the buildings at both ends, which have since been rebuilt using a combination of original and modern design."